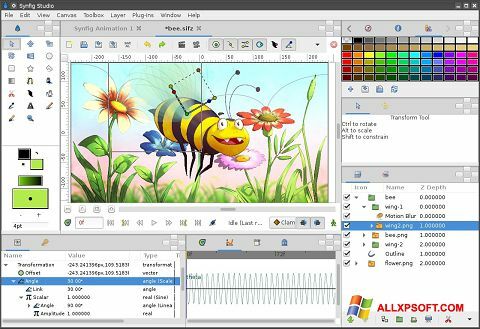 Synfig Studio for Windows XP - vector graphics editor designed to work with two-dimensional animation. The program makes it possible to save the time of the artist, since it does not need to create each frame separately. It is enough to create key images, and intermediate frames are generated by themselves, forming a smooth movement. The utility implemented layers, which allows the animator to edit individual elements without affecting the entire file. Simple, intuitive interface has many features that allow you to quickly learn how to create high-quality animations. You can free download Synfig Studio official latest version for Windows XP in English.